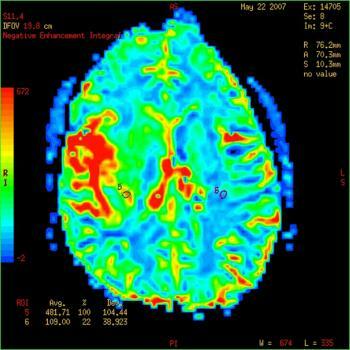 Glioblastoma is a particularly aggressive form of brain cancer that can be difficult to treat. New research, however, may have found a drug that can inhibit the protein driving its growth. Researchers may have found a way to inhibit the growth of brain tumors, here shown in an MRI scan. Glioblastomas are tumors that form out of the “sticky,” supportive tissue of the brain and spinal cord. Most of the time, glioblastomas are aggressive malignant; they are made of many different types of cells that reproduce very quickly and receive a significant blood supply. The 5-year survival rate is estimated to be less than 10 percent. Glioblastoma can be difficult to treat because of the heterogenous nature of its cells. Some of the cells may respond to therapy while others may not. Typically, treatment includes a combination of surgery, radiation, and chemotherapy. So far, this has resulted in a median survival of about 2 to 3 years for patients receiving standard treatment. Patients with more severe forms of glioblastoma, who receive a combination of drugs and radiation therapy, usually survive for an average of 14.6 months, and the 2-year survival rate is approximately 30 percent. Little can be done to treat recurrent glioblastoma. In this context, more and more researchers are exploring genetic options for treatment. Recent studies have pointed to mutations in the receptor tyrosine kinase (RTK) genes as the key driver of glioblastoma, but clinical trials aimed specifically at neutralizing these driver mutations were not successful in treating this form of cancer. However, researchers from the Peter O’Donnell Jr. Brain Institute and Harold C. Simmons Comprehensive Cancer Center may have found a way to inhibit glioblastoma cells. Their findings were published in the journal Cell Reports. The team – co-led by Dr. Robert Bachoo, of the Annette G. Strauss Center for Neuro-Oncology at University of Texas Southwestern Medical Center, and Dr. Ralf Kittler, an assistant professor of pharmacology in the Eugene McDermott Center for Human Growth and Development – successfully used a drug to target different proteins that drive the growth of glioblastoma tumors. The new study suggests that so far, researchers have mistakenly focused on RTK gene mutations, which are only responsible for starting tumor growth, not for the continued growth of glioblastoma. “Our work shows that the gene mutations which the pharmaceutical industry and clinicians have been focusing on are essential only for starting tumor growth. Once the tumor has advanced to the stage where patients seek treatment, these mutations are no longer required for continued tumor growth; they are in effect redundant,” explains co-senior author Dr. Bachoo. Instead of the RTK genes, the new study found three transcription factors to be responsible for glioblastoma: Sox2, Olig2, and Zeb1. In their study, Dr. Kittler, Dr. Bachoo, and team found the drug mithramycin to inhibit these transcription factors. However, the scientists warn that mithramycin may cause liver toxicity in a number of patients, and that repurposing the drug to treat glioblastoma could take several years. Previous articleNo Chiro Zone, Reversed!